Ghosts and Aliens at Haroldston House? Back in the early nineteen eighties when I was a young fellow there were a mere 3 channels on T.V, our gaming system was the mighty and legendary spectrum 48K and summers were long, hot and spent playing outside. Football in the street was the F.A cup final only interrupted occasionally by someone driving through, Cricket in the Park was the ashes accompanied by a terrible stench emitting from the cheese factory or sewage works in the evenings which always resulted in us blaming one another for “guffing”. It was a glorious time as it is often when seen through the eyes of nostalgia a backgound painted with perfect hot summer days. The gang would normally congregate in Walters avenue, Merlins Bridge, with skateboards and a football like “flies to manure” would comment one grumpy old man. We were children aged between 7 and 12 and would start appearing from about 11am and from there would plan our daily adventure mindful that we all had to be back home in time for tea for around five when our fathers would be returning from work. 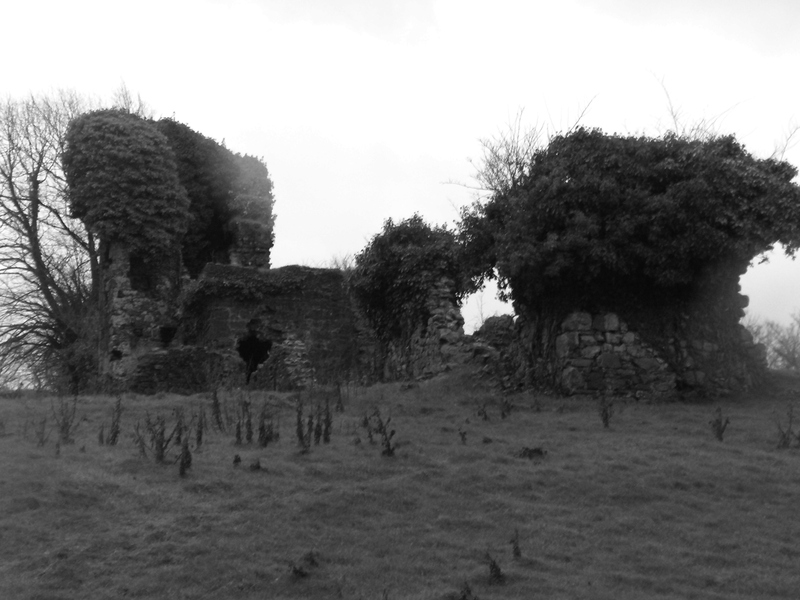 Haroldston House or the ruins as we called it with affection was a hive of adventure, archaeology and of course Ghosts. The first and more infamous of the ruins ghosts for us was the White lady. A tragic figure doomed to roam the ruined building that was losing its battle with Nature. This was decades before the project where Haroldston House was trimmed and tidied and nature tamed. No one knew who the white lady was only that she was “bad” a term we used to describe pretty much everything back then. It was like saying cool or awesome but in reverse. “My dad has a new car, its bad”, “I Fancy Sarah Jane, she’s bad.” I was frightened of the white Lady. It worried me in fact. I would lie in bed at night scared that she would try and climb in through my second storey window of my council house an rip me to shreds with long bony fingers, sprouting dirty razor blade sharp finger nails, while she screamed demonic tongues behind a dirty white veil. When I was aged thirteen I imagined something entirely different about a woman coming in through my bedroom window at night but that pubescent tale does not fit in with this story. Some older boys said they had seen her one evening before the dusk, white and terrible running through the flesh tearing brambles. This image haunted me for years until I caught up with one the lads in the mid-nineties when I was in College and when I asked him he laughed and admitted it “was just a carrier bag trapped in the brambles” But that seed, the imagery my mind conjured of the terrible soul he had seen lies fresh in my mind today as if I myself had witnessed it. Knowing it was just a carrier bag still never erased the image. 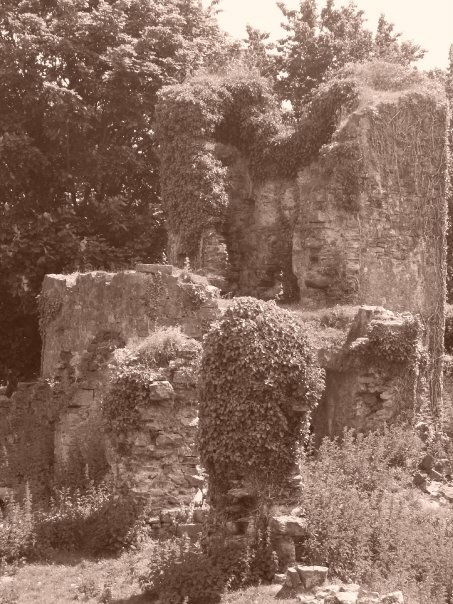 We spent many summers down at the ruins before we headed off to Tasker Millward or big school with little incident apart from a peculiar and very imaginative recanting by some younger lads who were horrified beyond belief by something they had seen at the bottom of the ruins by the style, an area we casually referred to as the Plague pits. 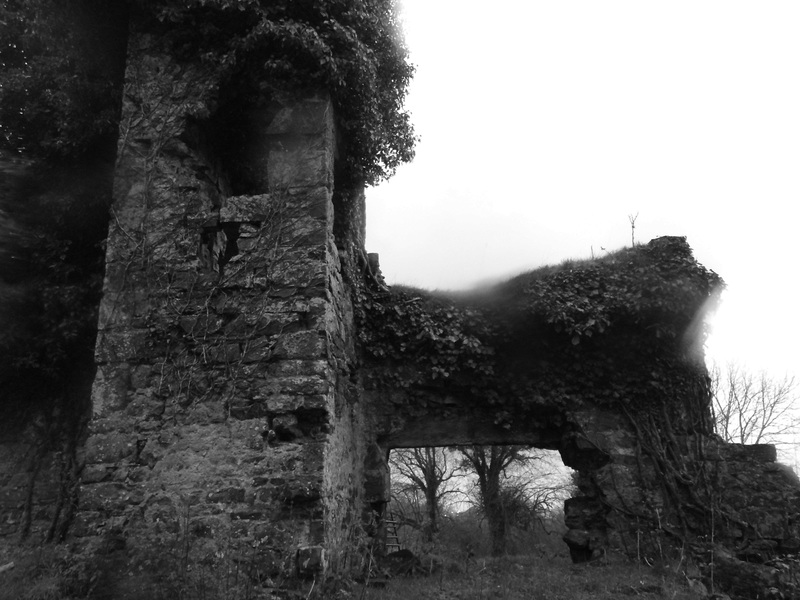 The boys had been sitting in the “tower” part as young lads do and one of them spotted moving slowly by the hedge at the bottom a large blurry object. The Other one quickly saw it and as it began ascending up towards them they bolted back to Merlins Bridge. I saw one of the boys that day and he was very distraught. It was no act unless this prank had totally captured his imagination and he had convinced himself for it to be true, Perhaps they were the victims of a joke or maybe just maybe they had seen something very real and very terrifying. There was only one option. Our first Ghostly Investigation. Off we embarked on our BMX’s old and wise compared to the youngsters and their tears. We spent hours down there scouring the area for a giant blurred abomination to reveal no trace of this strange entity. As time passed I would often wander down to the ruins to read or just to have an explore for old times’ sake. Nostalgia running rampant with the echoes of the past haunting me and as I got older it became a most suitable shortcut from nights on the town and never once did I feel threatened or anxious. (Unlike Clay lanes, the road running next to it: Please read “New year’s Phantom Hitch Hiker for more details). During my college year’s friends and I would camp down there with a guitar and a fire, some beers and inevitably I would try and convince the others that the White lady was very real and was peering out at us from deep within where the glow of the fire lost its battle with the night. On one such expedition a dear friend, Gwyn, played a wonderfully elaborate prank that did cause some distress. It was a hot summers evening and it was that beautiful time of night around ten when it’s that prefect twilight phase. There were about seven of us camped down on the “plague pits” with the backdrop of Haroldston House behind us. We had a mighty fire on the go, John peel on the radio and plenty of beer. Suddenly there came a flash from the ruins. Someone remarked that it was just a car headlight as it journeyed down the clay lanes. There was again another flash and in the distance, yet distinctive, the sound of a monk chanting. Another flash but this time closer and a weird ominous mist puffed up. One of the girls got quite upset and immediately blamed me for this happening. 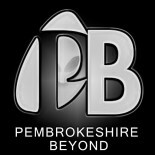 From the rubble appeared Gwyn with a CD player in his hand, a camera and a bag of flour. Only I appreciated his ingenious effort. In fact Gwyn would play that prank on other camping trips to similar responses. Gwyn and I once went in search of the big cat in the Preseli Mountains in an evening so bizarre that it deserves a blog of its own at a later date. My favourite Haroldston House memory was an evening where we decided to camp in the “tower” Itself. I was working at Tesco at the time and some of the lads I worked with along with some of my dear friends decided we would camp there. Again with the reassurance of a good fire and the Talisman that was our radio with John peel easing us into the night we sat with beer and tales. Staring back at us were in fact “Eyes, thousands of eyes”. The eyes were only a few feet above the ground and were all around us. Some were swaying, some were moving closer and all I could think of was aliens. Little grey aliens surrounding us to abduct us. Courageous Angharad returned smugly as all the gentleman laughed and pretended that we were not terrified out of our minds and bowels. We sat there talking about it for about forty minutes, each re-living their version of events when faintly we heard “Huh Huh Huh”. This time I had to be brave, I could not be seen to be terrified twice in an hour. I stood up and said to everybody “Listen”. “Huh, Huh, Huh.” Came the noise. I moved to the back wall of the building where a large hole in the wall led to the outside. As we got closer, a group moving instinctively as one we heard, “Huh Huh Huh HELP ME!” and there laying in a ditch trapped in the brambles like an old carrier bag was our Portly nervous friend. We had forgotten about him and his fear had led for him to hurl himself through the hole in the wall and into the night. He had lay there for over forty minutes, unable to move, unable to speak, he was a man succumbed to fear. I still pass through Haroldston house on my way to visit family and friends in Merlins Bridges. It has a wondrous beauty. In the summer when it is overgrown with Ivy it takes on an almost organic ambience, that it is more a part of the wild than of the men who built it. It’s a wonderful spot for a picnic or to take some photographs and I recommend having your own adventure there and enjoy exploring what’s left of it while you can. Others are more than welcome to argue but when I’m asked “Is it haunted?” I have to say no. No ghosts or aliens reside there, just fondness and the realization that it has been the backdrop for some wonderful times and how it makes me glow with happiness that I have so many good friends and that we shared many a good time there. Haunted? Only by memories. This entry was posted on March 29, 2015 by The Paranormal chronicles in Ghosts and Hauntings and tagged ghost, Haroldston House, hauntings.